Now TV has opened a nudist rooftop haven with views overlooking Parliament Square in Westminster, to coincide with the forecast of a mid-August heatwave. The venue, which opened on Tuesday (9 August), features an open-air bar, relaxing sun-bathing areas and the chance for visitors to enjoy a quick workout on a trampoline or a round of swing-ball. The activitation was devised by agency Taylor Herring. Now TV is aiming to encourage Brits to try out being ‘clothes-free’ as well as contract-free, by opening the naked sun terrace to mark the launch of the Now TV Combo, the UK’s first contract-free TV, broadband and calls bundle. Gidon Katz, managing director of Now TV, said: "As a nation, it seems we’re increasingly avoiding being ‘tied down’ in life – which is exactly what Now TV is all about. With the Now TV Combo we’re offering people the freedom to get the latest and best TV, broadband and calls, all without a contract. And we’re not stopping there. We’re going to keep breaking away from traditional conventions; firstly contracts, and now clothes, with the Now TV nudist terrace." The naked sun deck was opened following new research from Now TV that revealed that young Brits today are truly the ‘No Strings’ generation, as they avoid being ‘tied down’ in life compared to their parents. On average, today’s under 30s are revealed to have had 38% less serious relationships, lived in 28% more countries and worked for 15% more organisations than those 30 years ago. Now TV is looking to open the terrace on further dates this summer to encourage more people to embrace their contract-free ‘Now You Can’ outlook and is asking people to pre-register their interest via the nowtv.uk/comboterrace page. 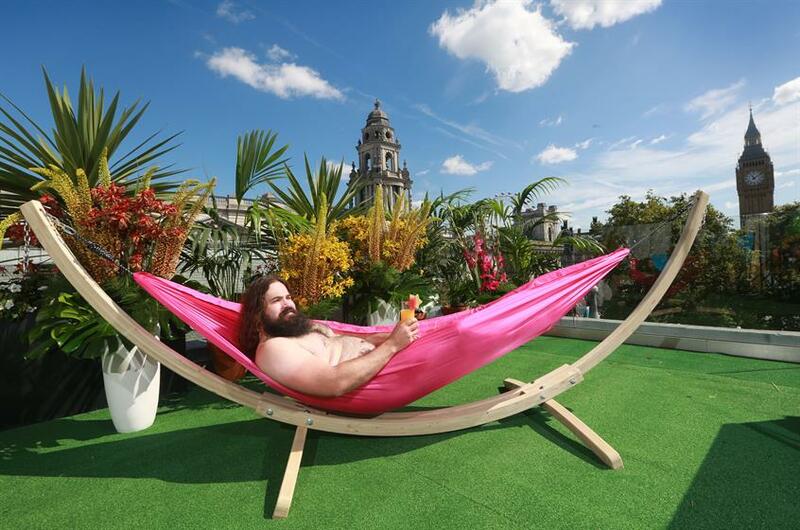 The Now TV nudist roof terrace is part of a series of ‘Now You Can’ activities taking place this week, including radio and social media competitions to win ‘Now You Can’ experiences. Now TV previously created a pitch in Trafalgar Square to mark the arrival of Sky Sports on Now TV. Other London summer terrace experiences include Sipsmith's residency at Craft London and Plymouth Gin's nautical-themed terrace.